Smartphones are very useful and well intergrated computers that have great benefits in our day-to-day activities. Most individuals benefits from the use of smartphones in terms of running their business tasks and other similar activities with the smartphone, like, storage of some vital office documents, files etc. Smartphones are really helping, unlike my tablet, which I use to run my blog and save some of my useful business and school documents. I could still regret the day I broke the screen of my tablet, it was like horro then, it took me over two months before I could replace the screen, due to I used non-branded device. 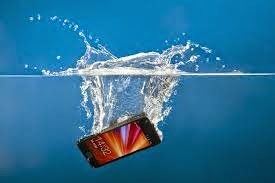 Maybe you’ve accidently thrown your smartphone into the water, toilet or any part of the water body, you don’t have to panic, simply follow the below procedures, and your smartphone would be back to function. Do not try to turn on the smartphone, or even operate on any of the navigation buttons. Do not loose any part of the smartphone to avoid the liquid from reaching the liquid damage indicator (LDI), because onces it’ts been reached, and noticed, it voids the warranty of the smartphone and also damages the exposed part of the smartphone. Do not even try to keep the smartphone under fan or even blow it, because it drives the water to other internal parts of the smartphone, which also leads to excessive damages on the smartphone. Do not place your smartphone under any form of heater like the microwave, or any form of dryer, because this equally damages the smartphone. Don’t even place the smartphone in any form of collant like the freezer, because it equally leads to excessive damage on the smartphone. After following the above techniques, simply leave your smartphone to get dried for like 3 days, then after, you are to insert your sim card and battery, then try playing some musics, to see the response of your speaker and other parts of your smartphone, if it’s response is poor, theni advice you charge your smartphone for some hours then try playing some musics with it, to see if it would recover. With the above procedures, you should be able to recover your smartphone in good shape, if it still doesn’t work, then I advice you take the smartphone to any specialist around your location. I dropped my phone in the toilet, and this list of tips was so helpful! It's now working and functioning! I just wish computer repair was as easy as following these steps!